Error Browsing from Client & Server: "Error: Access is Denied." In order for the WebAdvantage suite website to function correctly, it requires a valid username and password that is an Administrator of your Print Servers, otherwise this issue will occur. If the username and password provided for WebAdvantage is incorrect, or the account has changed, you will need to update it. Within the Start Menu or Control Panel locate Administrative Tools > Internet Information Services (IIS) Manager. 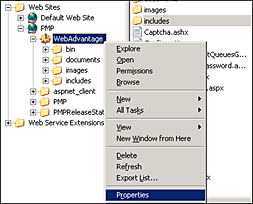 Inside of IIS, you can find your WebAdvantage application by expanding Sites > PMP > WebAdvantage. Right click on this web application and choose Properties. Set the username and password to be updated with the correct authentication information.